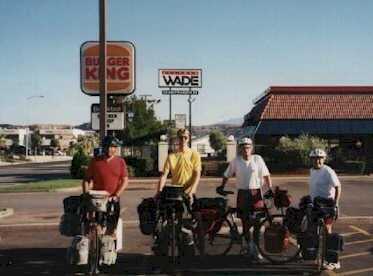 Our intrepid group of travelers converged on St. George Utah on Saturday, September 12, 1998. Rich and Freda had driven from their home in the Chicago area to California, where they visited family. They then drove back to St. George in time to meet up with Rick and I. After a 2 1/2 hour layover in Salt Lake City, I flew into St. George mid-afternoon on Saturday, and Rick arrived later that evening. None of us had met face-to-face until that evening. In fact, Rick didn't get to meet Rich and Freda until breakfast the next morning. The picture at left was taken outside of the restaurant where we ate on Sunday morning, just before we started off on our trip. From left to right we are; Rick Ralston, Allen Freeman, Rich Diebold, Freda Brown. Rt. 9 carries heavy traffic, but there is an ample shoulder all the way and we had easy cycling. The climate and terrain were totally new to someone from the east coast. The air was so dry that while I would sweat during a hard climb, once over the top and sailing down the other side my jersey would dry in minutes. It actually felt chilly when this happened! Quite a new experience for someone used to cycling all day with sweat-soaked clothes in the hot and humid eastern summer. We continued through Hurricane, La Verkin, Virgin, and Rockville, steadily climbing as we followed the Virgin River back towards it's source. The area had suffered some pretty heavy flooding in the week before our trip. Because of this, the Virgin River was quite muddy. There was also much more than the usual amount of sand, stones, and other junk along the road shoulder. As we turned north and went through Rockville towards the mouth of Zion Canyon at Springdale, there were sand bars along the sides of the road. Rick had noticed a clicking sound in one of his pedals, so we were on the lookout for a bike shop. On the outskirts of Springdale I noticed the "Bike Zion" bike shop, so I pulled in to wait for Rick to catch up and to see if he wanted to try to get his pedal fixed. A few minutes later, Rich and Freda showed up. We waited. We waited some more. "Do you think I should go look for him?" I asked. Well, of course everyone thought it would be a good idea for ME to go look. :-) It was kind of nice to be flying downhill instead of slogging up, but my enjoyment was tempered by the knowledge that I would have to turn around and re-do the climb. Somehow, I managed to fly right past Rick, who later reported that he had been sitting outside a gas station drinking a Coke and fighting back some heat-induced nausea. Eventually I decided I had backtracked far enough, and I turned around and climbed back up to the bike shop. There sat Rick, cooling his heels in the shade. 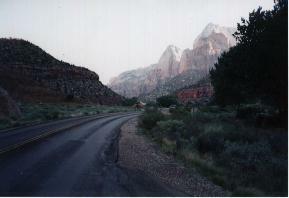 We were now just a few minutes from the entrance to Zion National Park. After stopping at the local grocery store, conveniently located immediately outside the entrance station to the park, we paid our $5.00 per cyclist entrance fee and headed to the campground to find a campsite for the next two nights. It was fairly late in the afternoon by the time we had settled into camp and by the time we were done with dinner it was getting dark. It was not until the next day that we got to start exploring the park in earnest. Monday morning Rich and Freda were off into town in search of a sit-down breakfast. Rick and I were traveling more on the economy plan, and made our own breakfast in camp. As soon as breakfast was over we were onto our bikes and headed up the canyon. The day was spent traveling up and down the canyon, and taking a few short hikes including the requisite pilgrimage to Zion Narrows. Rick and I also went back into Springdale to see if Rick could get some work done on his bike and also so he could send home a few things he decided he wouldn't need. I'm afraid the pictures here fail miserably in conveying the beauty of this place. I would continuously be riding along and feel a sudden chill run up my spine as I thought how truly blessed I was to be in such an incredible place.